[img]http://biologic.xyz/downloads/images/reddotsgreencells_thumb.jpg[/img] is not a valid Image. This macro analyzes fluorescence microscopy images produced by the in situ proximity ligation assay (PLA), also known as DuoLink. The PLA signal consists of fluorescent dots in images of cells or tissue. More specifically, the macro counts red dots only in green cells (expressing GFP, for example). A report including red dot counts and green cell areas is saved after analyzing a whole folder of images. 2. channel splitting (1 blue, 2 green and 3 red). 3. segmentation using the &#39;Statistical Region Merging&#39; plugin provided by Fiji, followed by thresholding, to detect all but the faintest green cells. 4. masking the red image with the green one to remove dots that don&#39;t overlap green areas. 5. counting and outlining remaining red dots with the &#39;Analyze Particles&#39; feature of ImageJ. 6. generating a report image by merging 3 color channels and white outlines of detected red dots. 7. preparing a table to summarize red dot counts and green cell areas. 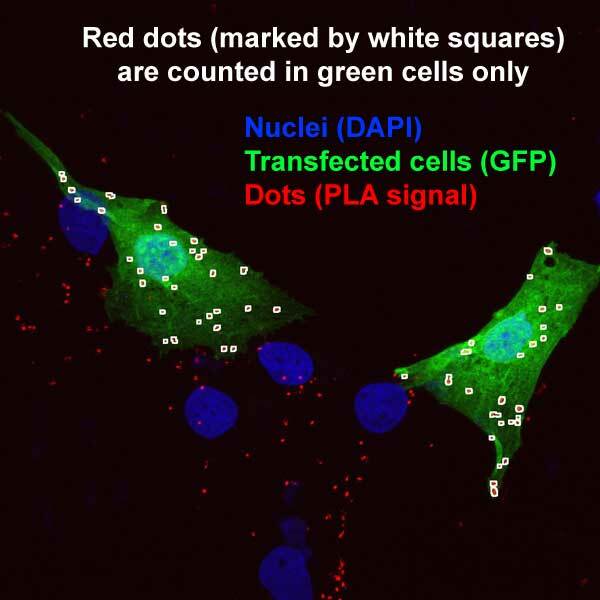 Please avoid taking pictures where green and non-green cells overlap because red dots produced by negative cells would be counted in overlapping regions. Works with Fiji / ImageJ (Version: 2.0.0-rc-15/1.49m from 2014-10-06), which runs under Intel Mac OS X 10.5 or later, Windows XP or later and Linux. Fiji is available for free from http://imagej.net/ or http://fiji.sc/Fiji. In addition to the macro, the download includes simple instructions to install and run the software, as well as an example image file that can be analyzed.